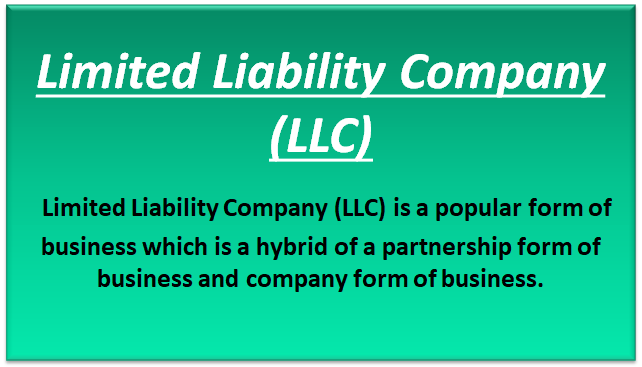 What is the Limited Liability Company? Getting started with a business involves many decisions which an entrepreneur undertakes and these decisions have a far-reaching impact on the business. Among the many decisions that an entrepreneur has to take one very important decision is related to the choice of the form of business. One can choose from various forms of businesses namely Sole Proprietorship, Partnership, Company and many more. Each business form has its own merits and demerits, legal formalities, tax implication etc. Among these business forms, there is one relatively new business form which is gaining popularity in the new age of entrepreneurship which is known as Limited Liability Company (LLC). Limited Liability Company (LLC) is a popular form of business which is a hybrid of a partnership form of business and company form of business. In other words, it provides the benefits of both these forms of business. Under this form of business, the owners are not personally liable for the company’s debts and liabilities (a feature peculiar to company form of business) and are provided same legal protection just like the members of a company. It implies that in the unlikely event of business suffering losses and getting sued creditors cannot make claim on the personal assets of the owners of LLC. Further, this business form can have an unlimited number of owners/members. The rules governing LLC differs from country to country and there is no uniformity in the same. Any business form opting for this form of business use LLC at the end of the entity’s name. For example, Clear Advisor LLC name itself signifies that the business is an LLC. An LLC can be started even with a single member and it is governed by its Memorandum of Association (MoA) and Article of Association (AoA). It is an ideal form of business form for small and medium scale businesses, early-stage startups as it is easy to form and requires minimal legal formalities to comply with and makes it easy for the entrepreneur to focus more on the operation and business aspect. Limited liability company (LLC) format requires fewer compliance formalities pertaining to conducting of Board Meeting, Annual general meeting, maintaining records of minutes of meetings and filing of statutory returns to name a few compared to a Corporation form of business. However, it is pertinent to note that compliance formalities are still substantially more complex than a partnership or sole proprietorship form of business. The business affairs of the LLC are looked after by the Board of Directors. Another characteristic of a Limited Liability Company is that the income of an LLC is treated as personal income of its members and as such taxes rates applicable to individuals are applied instead of corporate tax rates. These characteristics of a Limited Liability Company (LLC) is known as pass-through taxation and the benefit that accrue through this feature is that the profits are taxed only once in the hands of the members directly and no double taxation is faced which is normal practice in company form of business where income is first taxed at the corporate level and then at an individual level when profit is distributed in the form of dividend to shareholders. There is no limit on the maximum number of members in an LLC. Unlike a company or a partnership form of business, there are no restrictions on the maximum number of members in LLC. It cannot exist till perpetuity. It has a limited life and it ceases to exist and needs to be dissolved upon death or bankruptcy of its members or if any member leaves the organization. The first advantages of LLC are easy to form and involve lesser compliance formalities. LLC is not required to conduct the Annual General Meeting and also not required to file their Annual Reports with the appropriate authority of the country in which they are operating. The second advantages of LLC are eligible for pass-through taxation feature which implies that the company doesn’t pay on taxes or take losses. Any profit or loss of business is reported by the owners in their personal income tax returns. Thus this form of business avoids double taxation by way of firstly tax payment by the corporation along with Income tax paid by the individual members on the income received from the corporation. The third advantages of LLC which protect its members from personal liabilities as their liability is limited to the amount of agreed contribution and their personal assets cannot be recovered by the debtors. Limited Liability Company (LLC) form is suitable for small business. It is not an ideal form of business for business which aspires to go public. LLC have to be dissolved compulsorily on the death or bankruptcy of a member. It cannot run till perpetuity like a Corporation. In case any member leaves the business is compulsorily required to be wound up. However, the rest of the members, if wish to continue, can form a new LLC. It is a kind of partnership where the liability of partners is limited to the capital contributed by them. Limited Liability Company (LLC) is easy to incorporate the form of business that offers various benefits along with handful of challenges. It is up to the entrepreneur to decide which form of business to choose from as all the legal formalities before and after the set up of business lies in the form itself and as such this decision should be based upon the eventual goals of the business in question and the mindset of the entrepreneur.